Whether you just need a huge laundry bag that can be carried when full, or are looking for a set of bags to store hotel linen in, Neusu® heavy duty bedding bags have proved themselves the perfect choice for hotels across the UK. From individual hotels to small chains, as well as B&Bs, the 600D polyester we use is extremely strong and hard wearing, backed with PVC to make them damp resistant. As well as strong material, we use a better quality zip that’s stronger than most other storage bags use, and our unique design has 360-degree reinforced handles so that the bags can be picked up and carried even when full and heavy. We occasionally get asked why the handles are stitched onto the loop that runs underneath the bags, rather than being part of the loop, and the answer is that our design actually makes the handles even stronger. If you design the handles as part of the loop, then when you lift the bag when full, the handles will naturally pull at the fabric of the side and rip, but by web-stitching the handles to the 360-degree material loop that reinforces them, we add another layer making them even stronger. We’ve tested the bags ourselves with over 50Kg of weight and the handles and bags take the strain with ease. For hotels, this means that you can buy with confidence knowing that the bags can be used for laundry and linen storage and they won’t let you down. Our smallest of the heavy duty bags suitable for hotels, this is a twin pack of 50 Litre bags, offering 100 litres in total. They can be stacked on top of each other, as well as on top of our 100 Litre bags (see below) that are the same 47cm x 47cm width and length. These bags can store sheets and bed covers, but for duvets, look at the larger bags. Note the same high quality 600D polyester and fully reinforced handles are used as with our larger bags though, so if the size (47cm x 47cm x 23cm each) is suitable, then these bags can carry heavy loads. These heavy duty bedding cubes are a versatile choice for hotels, mixing capacity with flexibility. 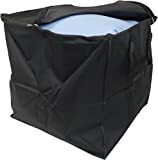 They can be carried by a single person with ease as they aren’t too large, so they can be used for laundry collection, but they are also big enough to pack in a duvet and pillows so can be used for storage – especially as you can easily stack multiple bags on top of each other to make the best use of space in storage rooms. Measuring 47cm x 47cm x 47cm, the bags can also be packed on top of the 150 Litre or 200 Litre bags below. If you need a moderate-sized storage solution, this is Neusu’s mid-size bedding chest (not too big, not too small!) offering 150 Litres of space. It can carry duvets, pillows and bedding and the carry handles can cope with extraordinary weight. The size (68cm x 47cm x 47cm) allows one person to still lift the bag, but it can be used for long term storage. Our largest bedding chest, offering 200 Litres of storage space, this can handle multiple duvets, pillows, bedding, etc. Once the bag is full, the handles can be used to lift and carry it, but it may require two people both because of the weight and size (91cm x 47cm x 47cm). You can stack both the 100 Litre and 50 Litre bags on top of this storage bag for best use of storage space. This size is our most popular with hotels as it offers huge capacity for a reasonable price. If you’re looking for something to carry bedding around the hotel, or store items in cupboards easily, our versatile bag is often the best combination of value and flexibility. It offers a generous 70 Litres of capacity and has the same fully reinforced handles. The zips extend down each side to allow the bag to open fully to make it easier to pack. Like everyone else, hotel businesses often find themselves short on space for storage, especially smaller hotel chains, and our hotel-grade underbed storage bags are flat and narrow, so are not just suitable for storing under beds, but also can be put onto shelves, on top of wardrobes or stacked on top of each other packed with bedding sets for ease of use.